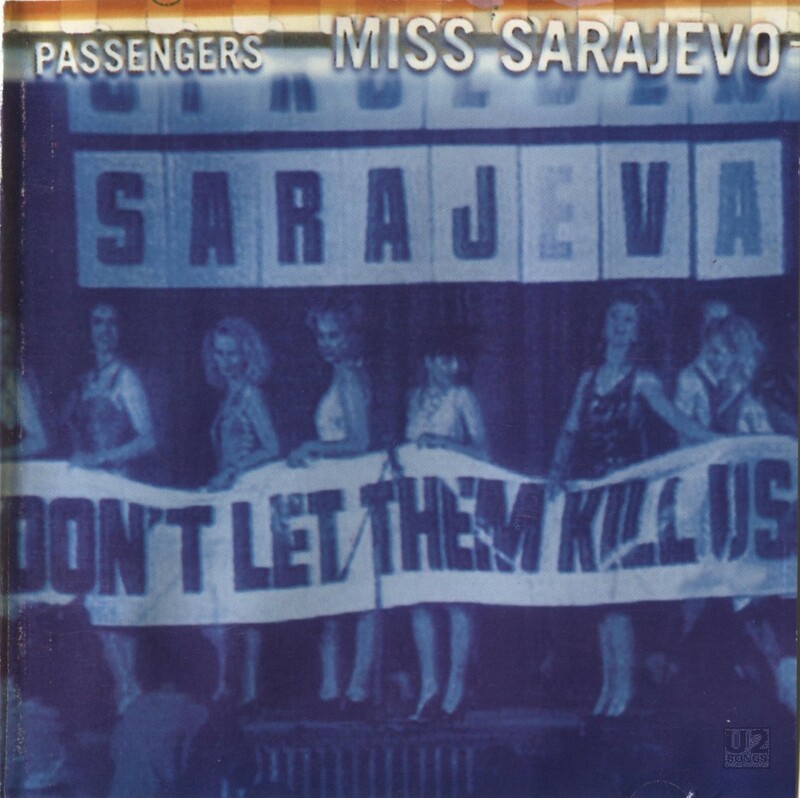 “Miss Sarajevo” was the first and only commercially released single from the Passengers album Original Soundtracks 1. A second single, “Your Blue Room” was readied, and promotional copies were released, but a commercial single never materialized—possibly due to the low performance of the album and the first single. Passengers was a group made up of all four members of U2, along with Brian Eno and a variety of guest artists (listed on promotional materials as “extra passengers”). Eno took on a much bigger role for Original Soundtracks 1 than he had on previous U2 albums, actively participating in writing and performing in addition to production work. Because the group was dubbed Passengers, the album received considerably less notice than a typical U2 release might have. “Miss Sarajevo” featured a guest vocalist, Luciano Pavarotti. The Italian tenor had been asking Bono for a song for a while, and when “Miss Sarajevo” was being developed the band felt that it would be a perfect opportunity to bring Pavarotti in to sing. The title and lyrics of the song refer to a beauty pageant held in war-torn Sarajevo. A video for “Miss Sarajevo” was released in two different edits. The first, directed by Maurice Linnane, features the Passengers performance of “Miss Sarajevo” live in Modena mixed with footage from Bill Carter’s Miss Sarajevo documentary. This version was most frequently played on music networks. A second, more hard-hitting version of the video eliminated the Modena footage and instead incorporated more images from the Miss Sarajevo documentary, augmented with statistics about the ongoing war in Bosnia. The director of this version is Bill Carter. Footage of the full live performance of “Miss Sarajevo” by Passengers at the War Child concert in Modena was released on the DVD Pavarotti and Friends Together for the Children of Bosnia. That video was directed by Mariele Ventre and produced by Nicoletta Mantovanti. “Miss Sarajevo” was performed only once in 1995, as part of the previously mentioned Pavarotti and Friends concert in Modena. In 1997, The PopMart Tour took U2 to Sarajevo, fulfilling a promise made during The Zoo TV Tour to play the war-ravaged country. “Miss Sarajevo” was performed at that concert, with Brian Eno again joining U2 on stage. It was the only performance of the song on The PopMart Tour. The song was later introduced on the second leg of The Vertigo Tour as U2 played Europe. Once part of the set, it remained as a regular fixture until the end of the tour. The U2360° Tour would also start without “Miss Sarajevo,” but it was introduced to the set during the fourth leg, and played nightly until the end of the tour. During U2’s concert performances of the song, Bono would sing the lines originally sung by Pavarotti. The song would return on The Joshua Tree 2017 tour, and was performed at 67% of the concerts on that tour. An audio version live from Milan on July 20, 2005 can be found on the “All Because of You” single and the fan club album U2.Communication. A video performance from the following night, July 21, was featured on a DVD accompanying the deluxe version of U218 Singles, with audio of that same performance available for download with the deluxe version of the album online. In 2011, members of the U2 Fan Club were given the opportunity to vote on 46 live tracks recorded during The U2360° Tour, with the top 22 songs to be included on a live album, U22. “Miss Sarajevo” was one of these choices. In the end, however, the song did not receive enough votes to appear on the final live compilation. The following year, the Edge picked his favorite tracks from the remaining 46 live tracks, and “Miss Sarajevo” recorded in Sao Paulo, Brazil on April 9, 2011 was included on From the Ground Up: Edge’s Picks. The album version of “Miss Sarajevo,” at 5:40 in length, can be found on Original Soundtracks 1 as well as on the Duals album released by the U2 fan club. The “Single Edit” (5:19) would later appear on the tribute album Diana, Princess of Wales. The “Radio Edit” (4:32) was included on The Best of 1990-2000 album and related promotional items, and on Pavarotti’s Duets album. Music by Passengers (Brian Eno, Bono, Adam Clayton, The Edge, Larry Mullen Jnr.) featuring extra Passenger Luciano Pavarotti. Engineered by Danton Supple. Assisted by Rob Kirwan. Additional engineering by Ruadhri Cushnan. Mix by Jeremy Wheatley. String Arrangement by Craig Armstrong. Special thanks to Anna Mazzarotto for lyric translation. Performed by Passengers (Some) at the War Child concert in Modena, 12th September, 1995. Words by Bono. Music by U2. Recorded by John Pellowe, Pen Fenner and Robbie Adams. Orchestration by Craig Armstrong. Conducted by Michael Kamen. Mixed by Mark ‘Spike’ Stent. Music by Passengers (Brian Eno, Bono, Adam Clayton, The Edge, Larry Mullen Jnr.) Original recording produced by Daniel Lanois and Brian Eno. Engineered by Flood. Assisted by Shannon strong and Robbie Adams. Mixed by Brian Eno. Music by Passengers (Brian Eno, Bono, Adam Clayton, The Edge, Larry Mullen Jnr.) Engineered by Danton Supple. Assisted by Rob Kirwan. Source programming by Marius De Vries. Front cover from the film “Miss Sarajevo” (Bill Carter, US, 1994). Artwork: Cally on Art Island.